BI'REAU (OF PLANT INl1TST'Y-Cicuilar No. :;1. NOTES ON THE Nl'. 4A"S:"
ASSISTANT A1(i ri/LIU'RIST, (OFFICI:E or FARM I XANA<;.I:mENT. (C hief of IBuria,. BEVERLY T. (6ALLONVAY. A-ssistat (Chirf of BLutreau, AI. ERT F. WOODs. (Chief Clerk. James E. .,ones. of such large quantities of nitrogen in the soil. NITROGEN FIXATION IN SOIL BY WILD LEGUMES. tance in this r6le than has been thought. Many ditliculties were experienced in collecting thie desired data. 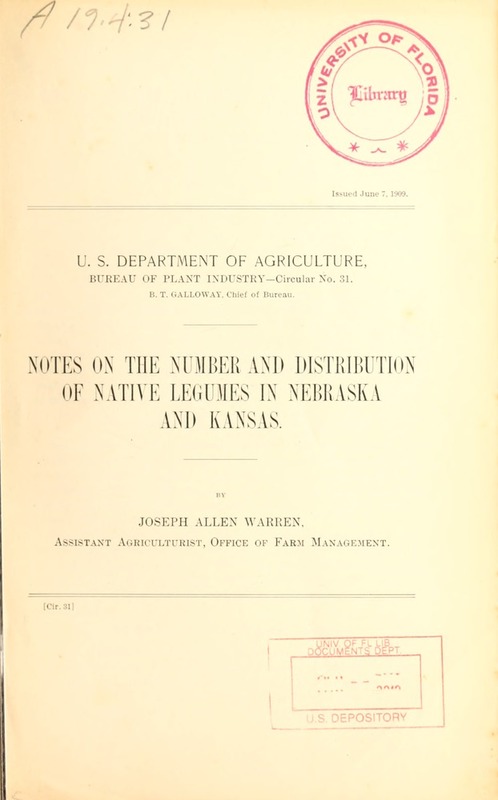 NATIVE LEGUMES OF NEBRASKA AND KANSAS. a'. ',:, farm lands of the region. galus, for example, are in fruit by May and often dead before July. dom find all the legumes at any one time. much doubt the group was always considered as a -.iigle plant. I TAIE I.-A-Numhi'r of ntire legume( s on certainn pidts in l hrnkad, Khtnasu, ind (olormlo. P 1 .l'. ily N ili. lI t >.iri.i N l>_. : i .
Id() .. . . .
lr t i) i .h .. X.. ..
W(r.i i > )i > .. .
Ir el .. .. .
1 n t" I' \ alle ..
[ ily .f.ill . . ]. ( I() . . . . . .
P ill;ii o I iI ii ..... .
LEGUMES FORM A LARGE PART OF OUR NATIVE FLORA. was not at all prepared for such results as are shown in the table. umes form a larger part of our flora than does any other group of plants. g.tht-r a large supply of nitrogen. NODULES ABUNDANT IN WILD LEGUMES. if the universal inoculation of the -,.-dliijg plants is considered. NATIVE I:, i I-':S ()F N1:1FIIASKA\ AN I) ANAS. FACTORS INFLUENCING THE DISTRIBUTION OF WILD LEGUMES. On the densest swards of BINlbi/is hlaclyloidr's (buffla o grass), Vicia. them are able to constitute a very large proportion of tlie plant growth. In many of the meadows in the river valleys of Iowa, South DIakota. ground. On level sand beds near streams Acuan grows in profusion. LEGUMES ARE CROWDED OUT ON THE RICHEST SOILS. been wa.shied down from 1lI,' i levels. NUMBER OF GENERA AND SPECIES IN DIFFERENT LOCALITIES. most of the farm lands. :'; of high prairies, saIndv ,luts and sand hills. SI'hvto..eo-rapiv 'of Ne ra-ska, p. 2-10. NATIVE LEiUMES OF NEBRASKA AND KANSAS. Astragalus, 4 Lespedeza, 3 Ara._'.llu.i-, and 1 Baptisia. the region Lotus has been very important. VALUE OF LEGUMES IN PASTURES. stock, for it thrives in pastures even where feed is scarce. LESSON OF THE PRAIRIE LEGUME FOR THE FARMER. Western farmers have been slow to learn their lesson from nature. N AII\ L 1.1 ~L ME-~ ii' N i;ni~ \~R \ AN ii i~. \N" \-~. WILD LEGUMES IN THE EASTERN UNITED STATES. plants di,]x- their work without a particle of labor (on tlie part of tlie ow er. other plants would ni ot succeed until ._n,-- had ,i,. i,,.d tihe \\*a (I'. lo). land legumes forrim one-fourth to three-fourths of thie hild plant-s. (1'. I,.